the gang's all back together! I'm loving this group. So much fun RP and a great fight to cap the session. Thank you again for such and awesome show! Again, getting used to characters and the party setup, i think it will be a lot faster now that the basic introductions have been done. @AdamKoebel , it seems like you threw some perception/hide at the tavern as GM rolls. I really haven't seen this before as as far as i remember the players have been called to do the rolls even if it would be rather obvious that something is going to happen. Are you going to go this route from now on or only do it in situations where the players aren't expecting immediate danger? Can we start to expect some GM fudging for the sake of narrative? I'm not saying it was done here or am i against it, but being really open with throws has kinda been a thing in CoS. I personally DM so that you can drop weapons without requiring anything but it usually means that stuff is scattered around the battlefield if people swap out weapons fast. It's quite a hassle to track and i don't think it would really work during the show because of this. For me it's still a bit jarring to have characters with swords outside with heavy crossbows at their back and then rush in to shoot and next turn just jump in with the sword. Oh look - it's that rules guy again. 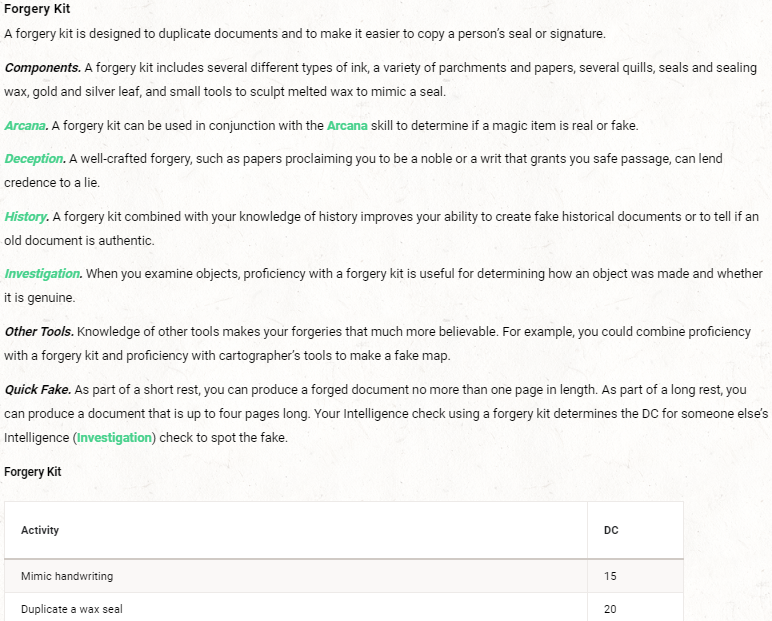 So, as far as Disguise/Forgery and the ability's keyed to the respective kits goes, while there is nothing explicit in the book for either, on page 178 of the PHB, under "Other Intelligence Checks", are listed examples, two of which being "Pull together a disguise to pass as a city guard" and "Forge a document". I will concede that JP using charisma in the moment made sense, as he wasn't trying to impersonate anyone, just trying to lessen his presence. 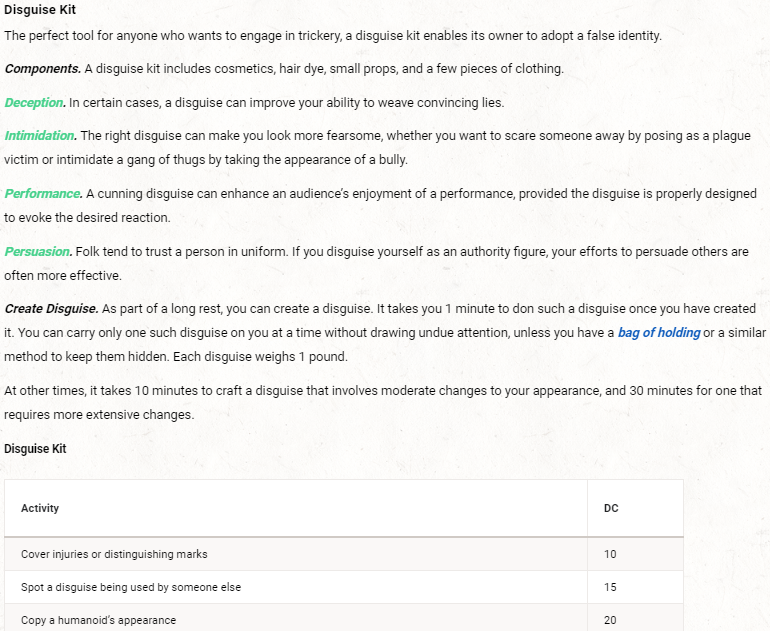 Fun fact - Disguise in previous editions keyed off of Charisma regardless of it's use. Probably a better decision for 5e to make such things open ended as far as what keys off of what. Using INT for forgery I think is made using the argument that you need to know what you're trying to forge - handwriting, seals, names, etc. Not sure if it was an "in the moment" decision by Adam or what, but the end result would of been a tie... which narratively, might of worked out the same way anyways. Regardless, it was good having Dan back - I missed his character interactions. you and I handle the weapon thing the same way - they drop stuff if they want to switch, not sheathe. that takes time. i don't tend to hide rolls, but every once in a while i need not to break flow or interrupt. it's a very rare thing and i'll never EVER fudge a roll. Now that we've sort of dropped the whole "CR" thing, how did you go about creating the Death Priest and his minion bounty hunters? Still kobold fightclub? I started with a Priest from the book, then added some stuff, changed up the spell list a little. His goons were the thugs from before, plus a couple veterans. I do love learning from my players and then being like "here now you have some"
Any idea on when the mp3 drops? I'm seriously loving this and avoiding all spoilers. Still waiting on Neb jazz mp3 also. Awesome episode. Great having Dan back! Question for @AdamKoebel. Do you think there's a risk for a Catch 22 situation with this XP system where they need to level up to finish a quest they're on, but to level up they need to finish the quest? @AdamKoebel Now that the experience system isn't using the basic rules, would you ever consider giving players XP if they correct you on rules (not minor, but something rather major like having two concentration spells)? Or do you think that this would just be too bad of an idea when one has to also consider chat getting a bit too rowdy? I do this to give an incentive for the players to focus on combat and have better understanding of the rules and it also makes me focus on what i'm doing. “A 10-foot-radius immobile dome of force springs into existence around and above you and remains stationary for the Duration. The spell ends if you leave its area. As written, if the other party members are with Sali when he casts the hut, they can go out and back in freely, but he himself cannot. Spells can’t go through the dome in either direction, but any arrows/bolts/whatnot that were inside when it was cast can be fired through it. As long as you have the time to set it up, the hut can be an impermeable eight-hour bunker with the other occupants popping (even leaning) back and forth at will. All that being said, I suspect this makes it one of the more frequently GM-modified spells out there. I appreciated the cosmetic touch of everyone perceiving the dome differently. Cheers. Said it in chat at some point, but I loved how obvious it was that the cast were having fun this session. Even when they weren't in scenes, zeke and dan (as the two I remember most clearly, not necessarily the only ones doing it) were visibly having a whale of a time. Reminder for @Ezekiel_III to bump his HP with his new con score if he hasn't already. They would just switch out a goal for a short term goal - "Prepare for X Mission." then they get XP for preparing for the thing they have to level up for. I’d hope if that happens they realize it and do some smaller quests. No, I don’t want to reward characters for things the players do in that way. I expect knowing the rules and helping out is something they’ll do because it’s good behaviour, you know? There are a bunch of good suggestions for tools in Xanathar's Guide to Everything. This was a lot of fun. Keep up the good work as usual. I'm so hyped for them to go back to the Wizard. That first episode when they met her was one of my favorites. Does anyone know what map Adam used for the fight the party talked there way out of last session and the map where they were ambushed?